largest producerof castings intheworld and has ambitious growth planswith newcapacities being added at rapid pace. The Indian Foundry Industry is producing estimated 9.344MillionMTofvarious gradesofCastings as per International standards. There are approx 4500 units out of which85%can be classified asSmallScale units&10%asMedium&5%as LargeScale units. Foundry Industry has a turnoverof approxUSD15 billionwith exports approx.USD2 billion. India's casting industry expectedto reachUSD19.2 billion by 2016. The healthy growthof exports – approx25%-30%yearonyear. 15 International Exhibition on Foundry th Technology, Equipment, Supplies and Services concurrent with 67 Indian th Foundry Congress will be an excellent platform for the Indian as well as overseas companies to showcase their state-ofthe- art technologies and services being offered to this vibrant industry to get exposedtonewbusiness opportunities. The only trade fair in India, which is rapidly becoming one of the important casting sourcing destinations in Asia - Cast India Expo will be organized concurrent to IFEX 2019 and 67 Indian Foundry Congress. th This is an excellent platform for the foundries from all across India to display their capacities and capabilities to the buyers comingfromacross the globe. Cast India Expo is a platform for the Indian Casting Manufacturers to display their casting manufacturing capacities and capabilities. 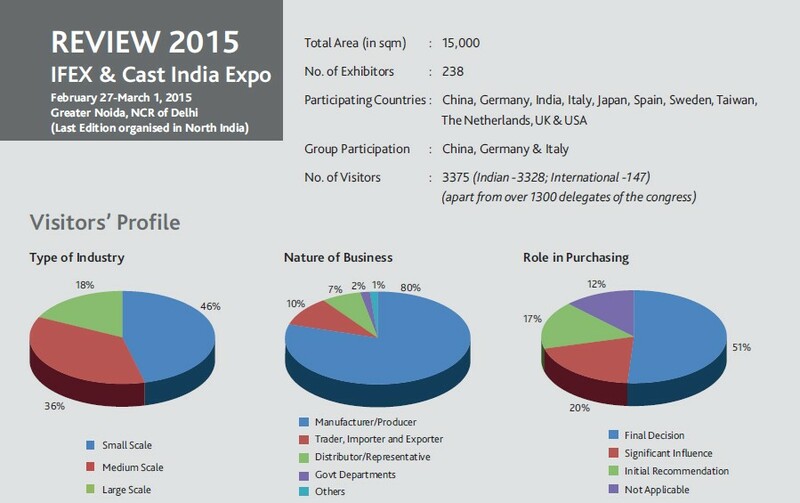 The presence of these casting manufacturers as exhibitors in the same venue will provide a ready customer base for Indian and International suppliers. IFEX, has now become the most important platform for the foundry industry of the Indian sub-continent as a sourcing ground for all theirfoundry requirements.